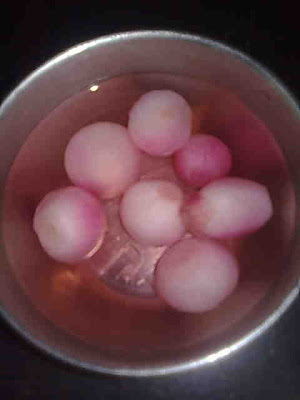 Sirka wala pyaz is also known as vinegar onions or pickled onions. This is a very easy recipe and correct way to prepare sirka onions. 1. Peel and wash pyaz. Pat dry on a kitchen towel. 2. Keep pyaz in a bowl and rub salt on them. 4. Pour sirka water over onions. 5. When sirka cools down, fill onions along with vinegar in a bottle and keep it in fridge. Sirka pyaz is fit for consumption after 1 day.